Tape in Extensions – revolutionising the industry! Tape hair extensions are revolutionising the hair extension industry and is fast becoming the new craze in the hair extension industry. 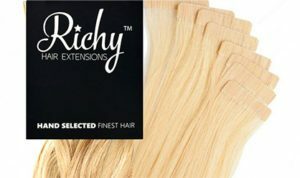 Finally The UK hair extension market is catching up with the Middle East and US market and is starting to realise that tape hair extensions are the way the industry is going. The tape system creates the most natural looking hair extension and it the safest method when used correctly. The reason I love this method so much is because when using bonds the hair can look a bit stringing from time to time. The tape hair extension method eliminates this and you just have fabulous looking hair 24/7. Another plus to this method is a lot less attachment points putting less stress on the hair. They also sit completely flat to the head so you don’t feel them at all. Another great thing about the tape hair extension system is that it is reusable making it maintainable financially for clients. Tape hair extensions should be moved up the head every 8 to 10 weeks to prevent damage to the natural hair. On very fine hair this process should take place around 6 weeks. After this period of time if you leave them in, yes they will most certainly cause damage to the natural hair because of the distance of growth from the scalp becomes to great. Its very important to choose a good tape product that wont fall out the head as some systems are better than others. When tape hair extensions are applied properly the tapes will not fall out the head until they are removed professionally by your technician. The tape hair Extension system works by 2 pieces of extension hair tapes sandwiching in between the clients natural hair. This is achieved by a sticky area on the tap it’s self. It is important to do your research to choose a hair extensionist who is an expert in the tape hair extensions process. it’s not just as simple as sandwiching the hair, if this process is not understood correctly. If too much or 2 little natural hair is placed in between the tapes or the tension is not correct on application damage to the natural hair may occur. The positioning is important too , the tapes have to be angled around the head to allow the hair to be put up and to fall naturally so they are not visible. Tape hair extensions have been around for quite awhile but no one in the UK has really been using them in the correct way because of the lack of product knowledge and training in this particular method. So anyone that has had a bad experience with these will be because either the branded product it not the most dynamic or the technician applied them incorrectly. When choosing a Tape hair extension product it’s not only about the hair quality it’s about the ease of how the tape hair extension comes out the head on removal. Many brands have not mastered the sticky area that attaches to the natural hair it either falls out very quickly or is impossible to get the sticky of the hair leaving untold residue on the hair causing damage and in some cases taking hours to get of the hair. There has become a stigma about hair extensions that they can be damaging to the natural hair but as I always say with all methods it’s not about the product! its about the skill of the person applying them that eliminates damage. This is the reason is why it is always imperative that you find a technician that knows exactly what they are doing on application. One extension applied in the incorrect way can lead to bald patches tension sores and hair loss. The product it’s self has many different aspects to what actually makes it a good product. The hair quality firstly I would always choose European hair with a slight wave. You keep up with your 6-8 week maintenances to pro event damage . As with any product in this world it is always about finding the right brand with the most innovative technology and has done the most research to perfecting the product .. There are the Bentley on hair extension product and then there are product which are cheap and cheerful. It’s all about finding the best. The product I use and recommends is the best in the world and it is Richy stickees it has all the aspects which make it a Bentley product and the hair can be used many times when it’s cared for correctly.